Last week was exiting experience for me. I had new friends from UTM Malaysia. When I listened to a key speaker of the conference, there were two women sat near me. They came late, same with me. I tried to open conversation then we talked many things. Till lunch time and conference was done, we continued talking. Ana and I had parallel session in different room but same room but different time with Alya. I listened to Alya’s presentation until I had my turn. I was second presenter of my session. I had no significant mistake but I still was not confident because of my research that I presented didn’t finished yet. Surprisingly, Ana and Alya was there. After parallel session, we continue talking but this was about my going back home to Bandung. They think that I used car (I said to them “kereta”, this word in Malay means car). I then explained for more than half of hour until we didn’t attend closing ceremony. They wanted to join me with little gambling if didn’t get train tickets to Bandung that night. We went to their homestay then moved toward Rangkasbitung train station by Go-car. 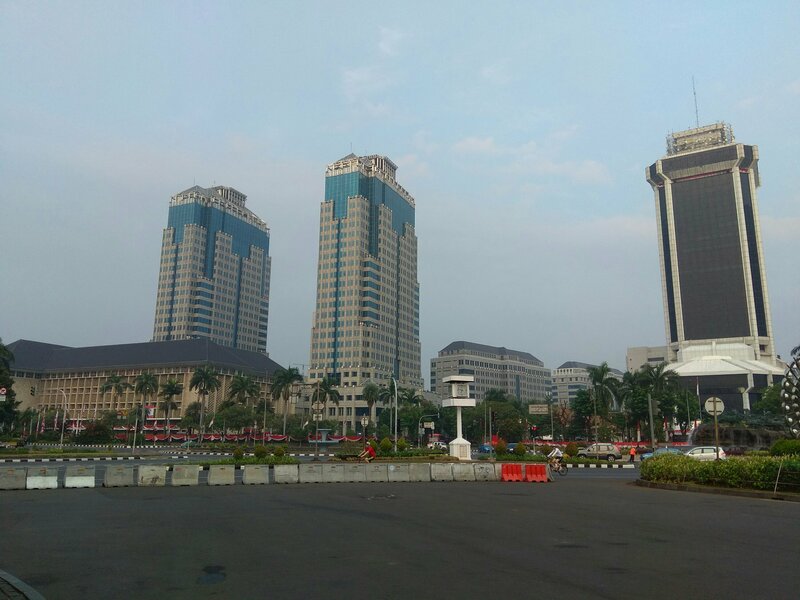 By Commuter line we headed to Tanaabang station then by Go-car we went to Gambir station. By 7.30 we arrived there, half hour before my departure. Unfortunately there was no ticket ready for new passenger, all were sold-out. 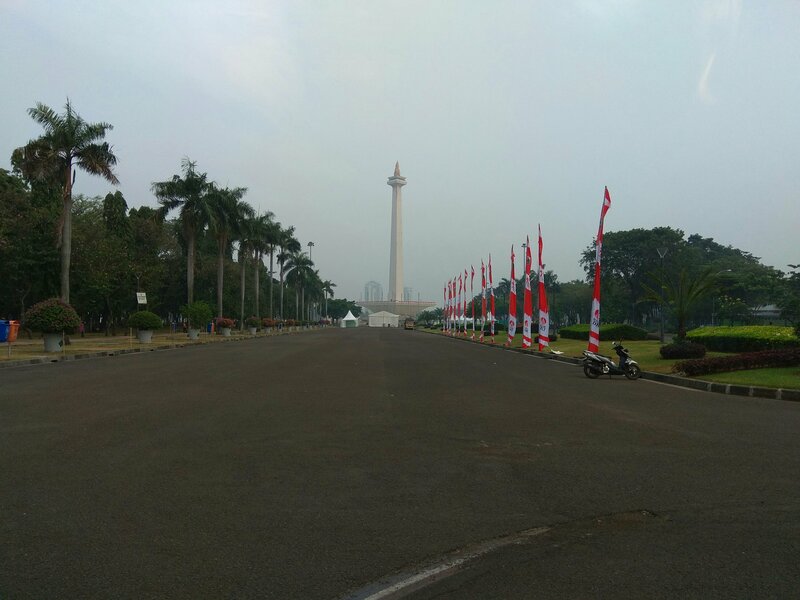 They stayed one day at Jakarta. Friday evening (2/11) they went to Bandung by car travel. We met again on tomorrow Saturday in north gate of Bandung station. After discussion, our trip that day was in Trans Studio before that I accompanied them shopping in Pasar Baru. I bought them having lunch at Mie Akung before spending approximately more than 3 hours in Trans Studio. In that day I was an impromptu tour guide. This was my first time. Yesterday my plane arrived in Balikpapan airport. Then by local taxi we headed to Swiss-belhotel to attend a workshop. It discussed about public service. As part of information officer, I was pointed to be part of this event accompanied by my boss. This is my first time going to Kalimantan island especially Balikpapan. So, I used rest of the time to enjoy this city. Last night I met my friend and today I visited melawai beach enjoying fired kakap and sunset. My photograph was uploaded in my Instagram account. I also took pictures around the hotel. I had story today. Several minutes after dinner, my phone battery was shot down. During waiting for the charge I went to toilet. Unfortunately after I came back to the place, my roommate (who brough charger) had went home. In another side, I had contacted my friend to hangout this night. I then drove public transport and went to Starbucks. In here, I met my friend after using WiFi with laptop. Monday morning at 9 AM, Air Asia brough me and also SBM guys to Kuala Lumpur. The aim was to join IC-HCKM conference. I was one of the presenters in parallel session. 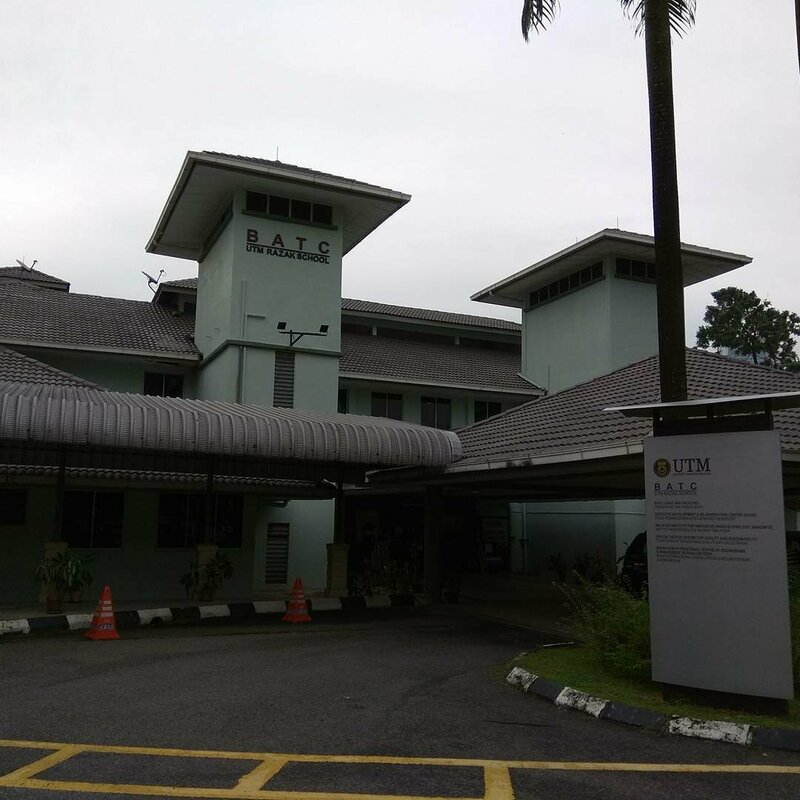 We stayed at UTM homestay in the UTM KL building area. From here, I can see twin towers of Petronas because of how near our place to the heart of city center. The agenda in the first day was just staying at the room and then hanging out at the night. 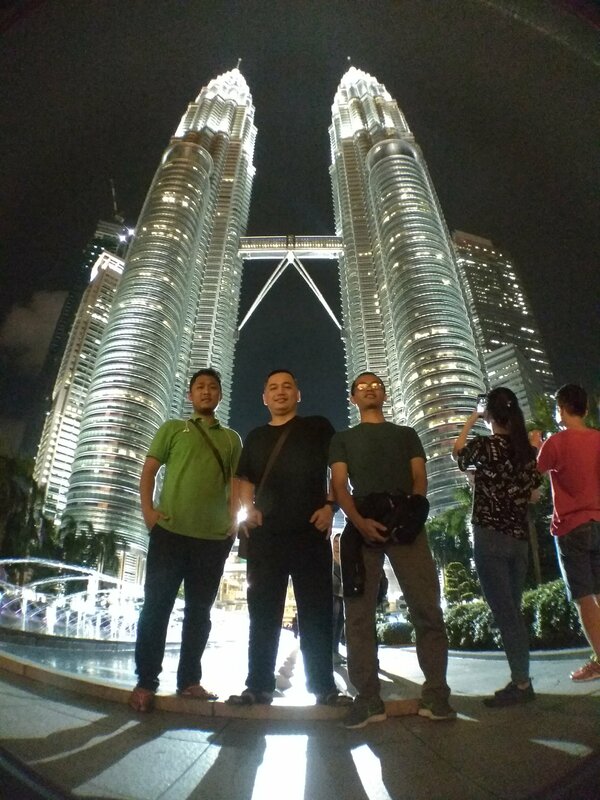 We (Pak Hary, Widi, and me) went to Petronas towers then looking for dinner in a food court (I forget with the name). When we went back to our dorm, somebody let us to deliver. We was surprised with this kind old guy. 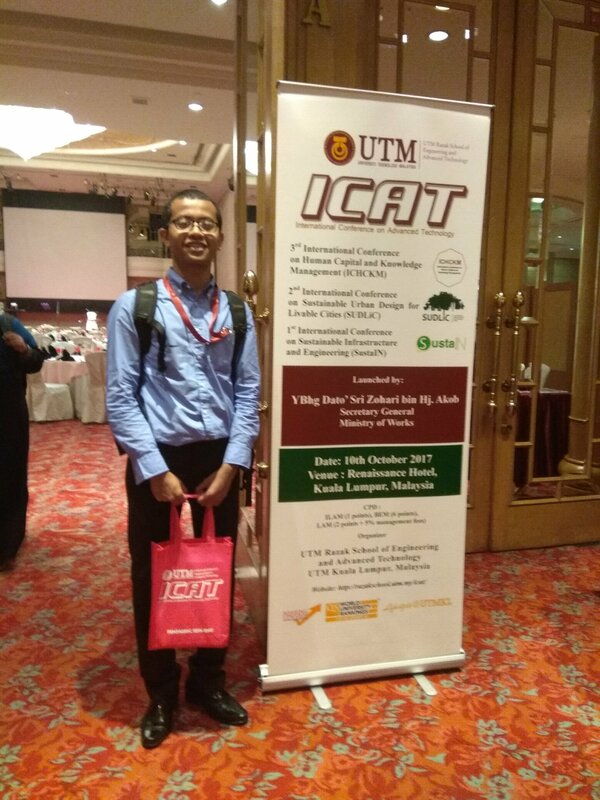 In the second day, we altogether joined seminar in Renaissance hotel in KL. All the day we spent here until dinner time. When the parallel session was going on, I attended the 2nd room with Pak Hary as moderator. When I presented some awkward moments happened when some audiences asked me including Pak Yan. I was so confused in that time. I got many noted for improvement of the research. In the last day, we went to Central market buying gifts (oleh-oleh).